Kids who play sports can reap many benefits, including improved physical fitness, development of athletic skills, team-building and, of course, fun. Student athletes who excel at a sport may even qualify for college athletic scholarships, which may tempt both kids and their parents to focus on a single sport, such as soccer, football or baseball. However, some pediatricians and sports medicine experts believe that specializing in one sport may put young athletes at risk of both physical injuries and burnout, especially if they do so at a young age. Last year, the American Academy of Pediatrics recommended that young athletes minimize these risks by waiting until age 15 or 16 to focus on a specific sport. In addition, the American Orthopaedic Society for Sports Medicine stated that in most sports, specializing at a young age offers no benefit. A study published in July in The American Journal of Sports Medicine appears to confirm that specialization may increase the risk of injuries among high school athletes by 50 percent. Among the most common injuries were ankle sprains, knee tendonitis, and stress fractures. Students were considered “highly specialized” if they had quit one sport to focus on another, considered their chosen sport more important, and trained more than eight months a year for their sport. Pediatricians believe it is important for young athletes to play a variety of sports, both to avoid overtaxing certain muscles and joints as well as to encourage a more balanced workout. 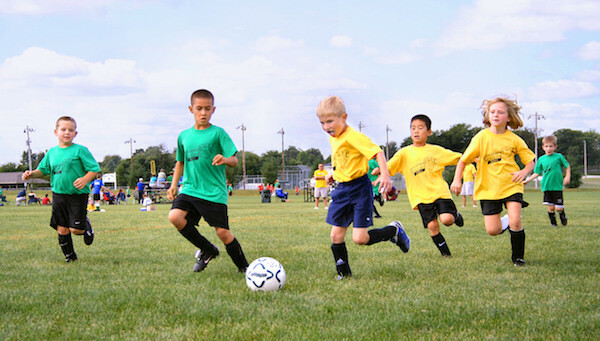 In addition to team sports, kids should have the opportunity to try individual sports such as swimming or martial arts. Parents should keep in mind that kids may not recognize subtle signs of injury or overuse until the damage has been done. Dr. Berger added that a good rule of thumb for training is to increase intensity, duration or frequency of activity by no more than 10 percent from week to week. Discuss the decision to specialize with your pediatrician or family doctor, who can help determine if the child is physically and emotionally ready for the demands of the sport, and offer suggestions to minimize injury. If kids are involved in high-level sports programs or clubs, ensure the coaches and trainers are well-qualified to work with youth, and closely monitor the training schedules. Encourage young athletes to take one-month breaks from their chosen sport at least three times a year, while still enjoying other activities. —“To Your Health” is brought to you by the physicians and staff of Scripps Health. For more information, visit scripps.org/SDCNN or call 619-319-9379.